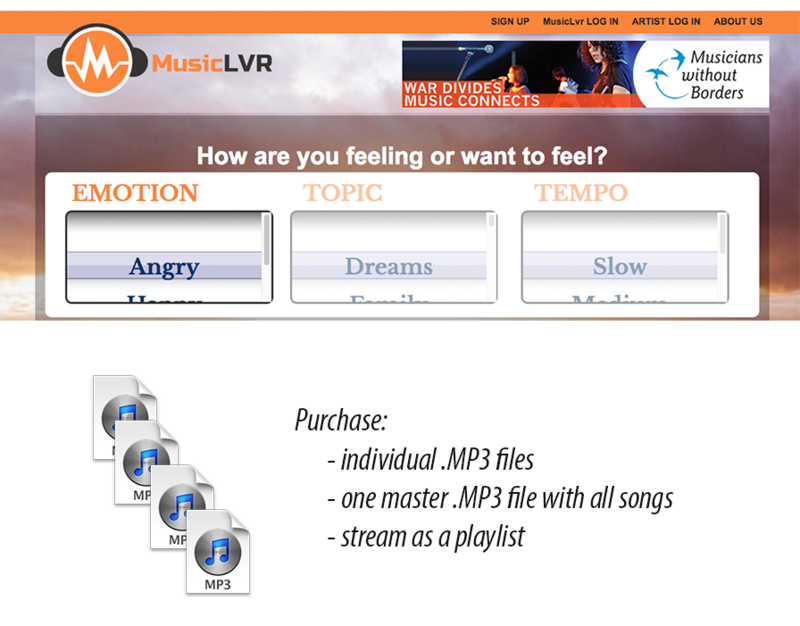 MusicLvr IS ONE OF THE POSSIBLE BUSINESS MODELS TO LAUNCH IN AN UBUNTU VILLAGE. It is a service that allows music lovers to connect to music creators. This service is geared towards the unsigned artist/band. The typical way to search for music is searching in a Genre (ie. Rock) / SubGenre (ie. Classic Rock) hierarchy where artists/bands that match are then listed alphabetically. A band like ZZ Top might never get discovered after someone going through all the other ones listed from A->Z. 1) How do you feel now or How do you want to feel? 2) What are you Angry about? From the search parameters of Angry about Relationships with a Fast beat. The results are any song, regardless of Genre, that matches songs from artists that are Angry about Relationships with a Fast beat. This means there could be Ska, Punk, Rock, Rap, Country, etc. Regardless of Genre, the songs were chosen by our staff as being songs that fit this classification. Someone who may not normally like Ska, might be happy to have discovered a Ska song that fit how they were feeling. We connect music with emotions and memories, so why not be able to search for music that way? The concept of MusicLvr was born over 15 years ago as TooManyNotes. Back then, there was no iTunes, Pandora, Spotify, SoundCloud, etc. There were no streaming services, it was CD's, Tapes, and Albums. We created technology that allowed a person to choose 10-12 songs of the same Emotion, Topic, and Tempo and burn them to a CD. The idea was that later on, you may purchase a CD that was Happy about Relatopnships with a Slow beat. The business model includes artists in profit-sharing. Every song they would get 80% of the $1/song price as the license. Flash forward 15 years and the progress of music to where alot of music is consumed through streaming services. Consumers are still purchasing singles and albums as digital .mp3 downloads. The evolution of MusicLvr is to carry forward the original concept, but to create one master .mp3 file that contains all the songs, in the order that the consumer created (ie. playlist), so that its easy to transport the group of songs to a play device. Consumers can choose to download the individual .mp3 versions as well. The MusicLvr venture can open up in every Ubuntu Community in the form of a Music Studio. Community members are able to contribute volunteer hours to helping with music production, to bring full time paid staff, to creative contributors. Songs produced by the community members allows for royalties to the artist as well as profit-sharing to flow to the community through the creative talents of the community members. Non-community members can participate, where they receive their royalties (less production expenses recoupment) and the venture receives the balance.